Ways to eat and drink healthy. The most essential rule about food, however, has nothing to do with quality, quantity or preparation, but with your mental attitude at the time you are eating it. Healthy Living is the number one goal among North Americans. However, 80% of the population do not know that cooking healthy, eating healthy foods such as fruits and vegetables, and making healthy choices can mean the difference between life and death. I have written this health and fitness article so that people can make healthy choices for their own personal health care and well being. 1. Do Not drink iced water, especially not with meals. This interferes with flow of your digestive juices and impairs digestion. 2. Drink a cup of fresh pure water, at room temperature, the first thing in the morning and last thing at night. You should drink it hot only when you are constipated. In that case, a little lime or lemon may be added. 3. Drink six to eight glasses of water every day, approximately one glass for every fourteen pounds of your body weight. Drink mineral water to be on safe side. 4. Do not drink water with your meals, but drink it half hour before or two to three hours after your meals so as not to disturb the process of your digestion by diluting the digestive juices. 5. Sip the water slowly, never swig it down at once. 6. In order to restore life elements of the water lost in boiling or processing, pass it through the air, pouring it from one cup to another. You will soon notice that this gives a slightly invigorating and stimulating effect, which is absent in dead and devitalized water. 7. It is better that you eat fresh fruits and vegetables than to drink fruit or vegetable juices. 8. Do not keep juices standing, as they will lose their precious enzymes. Apple juice for instance loses one third of them after 30 minutes and all of them after two hours. 9. Coffee, tea, alcohol and chocolate are not recommended because tannic acid, theine, caffeine and theobromine are stimulants. 10. Milk is really a food, not a drink. You should have it in small sips. Otherwise, it will likely produce indigestion. 11. It is not the amount of food you consume that nourishes your body, but only the amount the body itself can assimilate. 12. Choose carefully the foods that fit your system, choose them just as carefully as you choose a shirt, a hat or a tie. You have to try different food combinations until you figure out which health food suit you best. Make health choices such as steam fresh vegetables. 13. Avoid all devitalized foods like canned food, polished rice, white flour and white sugar. Use unpolished rice, whole wheat flour and brown sugar or honey. 14. Another healthy choice is to chew your food carefully and slowly, especially if it is the starchy kind, so that it may be properly mixed with saliva, otherwise starch will be waiting for digestion for several hours. 15. Toasted bread is better than fresh. Do not eat it with liquid. Drink before eating the bread, as starch should be converted into glucose by saliva. 16. Eat only one starch to a meal. For instance, if you have rice then omit potatoes, bread, macaroni starchy pudding and so on. 17. If you suffer from gas, it is advisable to plan your meals so that you do not eat protein and starch together; and especially not with cooked sulphur foods like green peas, cabbage, broccoli, eggs, turnips, and so on because gas is produced by sulphur working on the starch. 18. 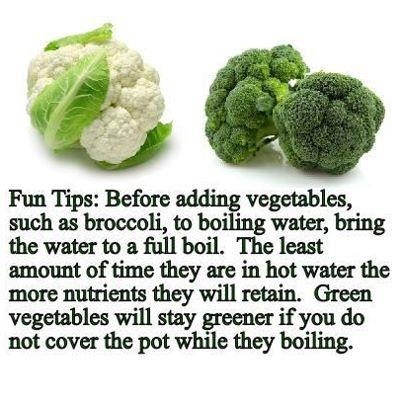 Do not throw away the water in which vegetables have been boiled but use it for gravies, soup or for drinking. Potato water is excellent as it alkalizes the body. 19. Fried greasy foods as well as rich dishes should be avoided altogether, because these digest more slowly than fat itself. Fat is the last to leave your stomach, carbohydrates is first and then proteins. 20. All saturated fats, such as lard, butter, margarine, eggs, and dairy products will increase the blood cholesterol level and can be classified as unessential fats. 21. Any diet which is high in saturated fat is dangerous. So you should eat a balanced meal, a high fat and low protein diet inhibits the function of enzymes. 22. Remember, it is not only the calories and amount of fat that decide the nutrition and health, but the quality of fat. Bacon, for instance has caloric fat value only. It contains nothing else, neither vitamins, nor minerals. 23. Six cups of fresh raw cabbage juice a day keep peptic ulcers away. 24. The richest source of protein is soya bean. Two pounds of soya been flour contain as much protein as five pounds of cheese, five pounds of boneless meat or six dozen eggs or 10 liters of milk. Soya bean is the only non-acid forming protein. 25. The most essential rule about food, however, has nothing to do with quality, quantity or preparation, but with your mental attitude at the time you are eating it.